This book, now in its third edition, has been a staple in mainframe education since the early 1980s. Many programmers have told us that it has the best conceptual background on CICS they’ve ever seen. As a result, your students will gain insight into how CICS fits into the mainframe structure as they learn the details of CICS application programming. And, yes, this book will outperform any training materials that are available from IBM. Although this book was published in 2001, trainers at mainframe shops tell us that CICS programming is still being done the way it’s presented in this book. Today, however, most CICS work is maintenance programming on “legacy” applications. CICS (Customer Information Control System) is the world-class transaction processor that’s used for interactive transactions on IBM mainframe computers. 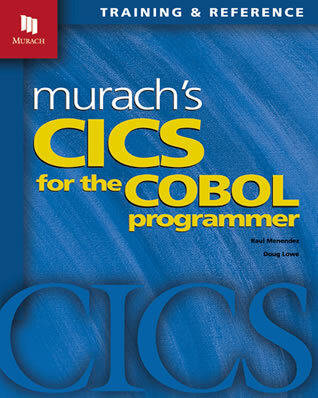 The vast majority of the CICS code for those applications is in the form of CICS commands that are embedded within COBOL programs, which is why this book is called CICS for the COBOL Programmer. Chapter 1 presents the essential CICS concepts and terms. Chapter 2 shows how all the pieces of a CICS program work together. Chapter 3 shows how to design a CICS program using pseudo-conversational design. Chapter 4 shows how to create the BMS mapset that defines the screens a program will display. Chapter 5 presents the CICS commands that are used in most CICS programs. Chapter 6 shows how to test a CICS program. At that point, your students will be able to develop CICS programs of their own, and they’ll have a solid understanding of what they have to do to become proficient CICS programmers. For a college course, that may be all that you want to assign. Section 3 present additional CICS commands and techniques that are used regularly. Section 4 presents a complete CICS application that consists of four programs. Section 5 presents the CICS commands and techniques for file and database processing. Section 6 presents advanced CICS features and skills. Chapter 20 shows how to design, code, and test CICS programs in which the “presentation logic” (all the functions related to sending data to and receiving data from the terminal) is separated from the “business logic” (the functions that process the data). Chapter 21 shows how this separation of logic can also be used for web applications, thus making CICS a more flexible transaction processor for enterprise applications. Last, because maintenance programming is the norm in a CICS shop, chapter 22 presents the type of code that you may come across as you maintain older programs. This book gets your students started fast. In chapter 2, they’ll learn how a complete CICS program works. And by the end of section 2 (just 6 chapters), they’ll be able to design, code, and test CICS programs of their own. Once your students complete the first two sections of the book, you can assign the chapters in sections 3, 5, and 6 in whatever sequence you prefer. That’s because the chapters in those sections are designed as independent modules. 12 full programs and dozens of coding segments illustrate the design and coding practices that are used in the best CICS shops. If you offer mainframe programming courses in your curriculum, this book can be used for a complete course in CICS programing. It can also be used as an information-only supplement to a COBOL programming course to show how CICS is integrated with COBOL in a COBOL/CICS program on a mainframe. Since CICS applications run on IBM mainframes, this book is best used in curricula that provide free access to an IBM mainframe. Then, your students can compile and test their exercises and projects on that mainframe. If your school doesn’t have access to an IBM mainframe, you can use this book to teach CICS programming as an information-only course. Then, you won’t need a computer lab at all. This can work in conjunction with a COBOL course when you just want your students to know what’s different about CICS programming and where it fits in the IT job market. Since this book was published in 2001, it doesn’t have all of the courseware components described in About our Courseware. What follows, though, is a quick summary of what’s available with this book. For a more detailed description in PDF format, please read the Instructor’s Summary. The source code for the 12 complete programs in the book. There are no book corrections that we know of at this time. If you find any, please email us, and we’ll post any corrections that affect the technical accuracy of the book here. Thank you!